All it takes is vision—Blow Your Socks off Vision. Exactly the kind of vision you’d expect to get when you follow Jesus of Nazareth. The vision that drove his ministry surpasses all others. That’s why Jesus is the greatest leader of all time, and why following his example can help you lead your family, church, friends, or coworkers—toward dreams worth reaching for and goals worth achieving. In this seminar, Bill Perkins will tell you how. He shows you principles from Jesus’ life that will awaken your character. Awaken your skills. At the event those who attend are encouraged to get into an eight-week follow up study in which they use Awaken the Leader Within and the discussion questions at the end of each chapter. This will enable them to flesh-out what they learned at the seminar and in the process strengthen them as leaders while helping your church or other organization move toward the realization of its vision. The idea is for a Leader Event to create momentum which is then captured by the eight-week follow-up studies and maintained by those groups that continue on after the eight weeks. Former United States president Dwight D. Eisenhower defined leadership as “the art of getting someone else to do something you want done because he wants to do it.” If you accept that definition of leadership then you’re a leader and so is everyone on your team. How do we know? Because at the point in time when they’re trying to get someone else to do something they’re exercising leadership. So the question isn’t: “Are they leaders?” The question is: “How can they be more effective leaders?” This four session seminar will enable them to awaken their character and their skills so they can lead like Jesus led. 7:50 Awaken Integrity – Cultivate the most important leadership trait of all..
8:45 Awaken the Vision – Discover how to formulate and communicate a compelling vision. 10:05 Awaken Your Team – Build a team that’s stronger than its parts. 11:10 Awaken Self-Control — Strengthen your character and assure your legacy by harnessing your appetites. Events may take place Friday night and Saturday morning to leave time for other weekend activities. 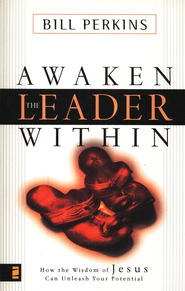 Participants will be encouraged to meet in an eight-week follow-up group in which they read through Awaken the Leader Within and discuss what they’re learning about leadership.